Argentina has announced new controls on ships passing through its waters to the Falkland Islands in a growing dispute over British oil drilling plans. 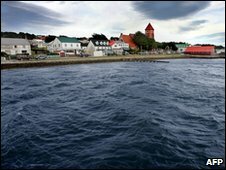 A permit will now be needed by ships using Argentine waters en route to the Falklands, South Georgia or the South Sandwich Islands - all UK controlled. Argentina has protested to the UK about oil exploration due to begin next week. The UK Foreign Office said the Falkland Islands' waters were controlled by its authorities and would not be affected. Buenos Aires claims sovereignty over the Falkland Islands, which it calls Islas Malvinas. It has previously threatened that any company exploring for oil and gas in the waters around the territory will not be allowed to operate in Argentina. On Tuesday, Argentine President Cristina Fernandez signed a decree requiring all vessels travelling between Argentina and the islands, or those that want to cross Argentine territorial waters en route to the Falklands, to seek prior permission. Cabinet Chief Anibal Fernandez said the decree sought to achieve "not only a defence of Argentine sovereignty but also of all the resources" in the area. Last week, a ship carrying drilling equipment was detained by Argentine officials. Have Your Say: How serious is row? But a drilling rig from the Scottish highlands, the Ocean Guardian, is nearing the islands and due to start drilling next week, the UK-based company Desire Petroleum has said. However, a spokesman for the company declined to comment on the growing dispute between the UK and Argentina over oil and gas exploration. Chairman of the Parliamentary all-party Falklands group, Sir Nicholas Winterton, said the Argentine decree was "pathetic and useless" and designed simply to try to impede the economic progress of the islands. He said he would seek a meeting with senior Foreign Office officials to discuss the issue next week. BBC world affairs correspondent Peter Biles said Argentine anger over the issue had been "brewing for a while". He said: "The sabre-rattling over oil in the South Atlantic is just the latest episode in a dispute that's remained unresolved since the Falklands War nearly 28 years ago." He told BBC Radio 5 live he did not think events would escalate "at this stage" but uncertainty remained over what the Argentines regarded as their territorial waters. After Argentina's invasion of the Falklands in 1982, a UK taskforce seized back control in a short war that claimed the lives of 649 Argentine and 255 British troops. The waters surrounding the disputed islands are considered by the UK as part of the British Overseas Territories. But Buenos Aires believes the UK is illegally occupying the Falklands, South Georgia and the South Sandwich Islands. Last year it submitted a claim to the United Nations for a vast expanse of ocean, based on research into the extent of the continental shelf, stretching to the Antarctic and including the island chains governed by Britain. Jan Cheek, a member of the Falklands' Legislative Assembly, told BBC Radio 5 live the new controls were part of a "continuing irritation for us". "While, of course, Argentina is free to do what it wants in its territorial waters, I don't think they have any right to interfere in ours," she said. She added Argentina had in the past "interfered" by refusing charter flights heading to the Falklands through its air space, and stopping fishing and cargo vessels. "It's more of the same and we come to expect it when Argentina's government are experiencing difficulties at home. We're a very convenient distraction." A UK Foreign Office statement said: "Regulations governing Argentine territorial waters are a matter for the Argentine authorities. It added that the UK and Argentina were "important partners" with a "close and productive relationship". "We want, and have offered, to co-operate on South Atlantic issues. We will work to develop this relationship further," the statement said. Geologists think the South Atlantic ocean bed surrounding the Falklands could contain rich energy reserves.